This is the definitive guide for how to SECURE and DEFEND your home and PROTECT your family from violent criminals and psychotic maniacs who wish to harm your family! No one thinks a violent home invasion will happen to them. Maybe you think you’re safe because you have a high dollar home security system….Or maybe it’s because you have a neighborhood watch program…Or maybe you think that loaded handgun you keep by your bedside will protect your family. The bottom line is NONE of these things is guaranteed to prevent your family from becoming the next home invasion horror story. 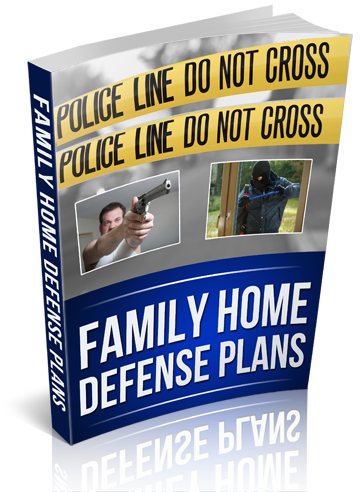 In Family Home Defense Plans, you’ll learn little known ways you can fortify your home and protect your family from practically anything that comes your way…And you’ll be able to do it for PENNIES on the dollar! NOTE: Thank you for your interest in our product. Please note that we use Nanacast for our shopping cart service. Once you click the button below you will be redirected to Nanacast to complete your purchase. Thank you. Click the button below to continue on to our shopping cart Nanacast's secure checkout page. We are actively looking for new partners for more projects. Click here to contact us about your project.